Footwear is quite possibly the most important tool I’ll have on my entire trip. I know I’ll go through several pairs in 8,000 miles and if they aren’t just right it will make my life a lot tougher. Back in March I started doing tests. Remember, I don’t want hiking boots: too heavy. And I’m skeptical of athletic shoes with their typical oversized ankle support. At the same time, I don’t want to buy into the claims of barefoot runners—who say minimal, flat soles are the best—without any science. So I did a comparison. 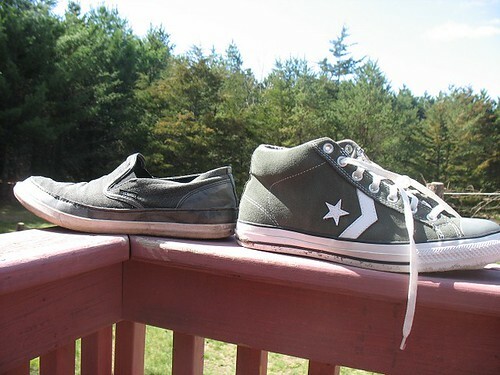 I got a pair of Chuck Taylor All Stars, which have a thick heel and pronounced arch support like most athletic shoes, and a pair of Steve Madden canvas shoes with a sole as thin and flat as a piece of leather. You may remember me comparing these on a 6.5 mile hike on asphalt and off-road, scrambling over a bluff. I said I’d also compare them running—but that never happened. In April I suffered what may have been a stress fracture in one foot, putting the damper on my daily training sessions and ad-hoc experiments. Well, the foot’s almost better now, and I’ve still never done a formal running test for the two pairs of shoes. But I did actually go jogging in both of them at different times. So for the sake of closure (sweet, sweet closure) and to round out the record, I want to include the results here. For my other tests there was a method. I would hold the tests several days apart. I timed each one so I could see the impact, if any, on my speed. I can’t say I did any of those things in this case, because I never got to the stage of formal testing. I just happened to go with my mom on her daily jog several times, trying different shoes each day. To further complicate matters we didn’t even keep a consistent pace. It was jog, walk, jog, walk, whenever she would happen to get tired. I’d say we jogged more than walked, and got about the same amount of running on both days, but exactly how much I can’t tell you. On the other hand there were consistencies. I certainly did my warm ups before each session, and we took the same route each time. Weather conditions were similar. We stuck to flat, asphalt paved roads. I was able to feel the difference between the two pairs of shoes during the shorts bursts of running. Running in these shoes was surprisingly comfortable. I was wary that the impact would aggravate my old ankle injury, especially with so little padding. Perhaps it would for a very long distance run, but for short distances it was no problem at all. Running felt natural and easy. I outpaced my mom and, during our rest periods, I paid close attention to my feet and ankles. There was no soreness. I had no formal cool off period after the run, but even so, there was no added stiffness or soreness to my old injury that evening or the next morning. The run caused no problems. These shoes were comfortable in a different way. The added padding certainly made my footfalls feel less impact. But it didn’t take long to feel the difference with the thick heel padding, and it was not a comfortable difference. Running in this kind of shoe forces a very strong heel strike that happens earlier than a natural footfall. It felt out of place and jarring. I wondered if I just wasn’t used to it. I tried to adjust my gait or footfall in some way to take advantage of it. All that happened is I found myself exaggerating my steps to try to get rid of it. I gave the strong heel strike a chance and ran that way for a while. It is possible to get used to it, but I noticed that my knees took up a lot of the extra impact. That concerns me. I felt no added soreness that evening or the next day. I was surprised that there was such a pronounced and immediate difference in how the two shoes felt. When walking the difference isn’t nearly as extreme. The All Stars with their big heels made me feel off-balance and clunky. I felt like I must be lunging up and down, like riding on a camel’s back, to deal with the heels. There are certainly drawbacks to the Maddens. I can see how someone with very flat feet wouldn’t be able to run in them. And anyone would need to do a lot of gradual training before using them for long runs, or else face some serious soreness. But compare that to the athletic shoes. They’re more comfortable up front, but the added strain on the knees frightens me. I prefer an honest shoe that tells me when I’m overtraining to one that hides potential injuries. You can see the direction I’m leaning in: I don’t like the thick heel padding. But I’ve also seen its merits in my trials, and have experienced the drawbacks of minimal soles firsthand. Last week I finally bought my shoes—the shoes for the trip. What do you think I got? I figure you’re going to go with the honest shoe, the flatter one with less padding. Most of your walking will be on or alongside roads and running wont be necessary (I hope!) at all, except for maybe the occassional sprint to cross heavy traffic or something. Not quite! The big reveal just went up… here.